Atopic dermatitis is the most common form of eczema. It affects infants and young children but can continue later into life. An important aspect of atopic dermatitis is its recurrent waxing and waning course. Children with atopic dermatitis have symptoms that come and go. As many children get older, the frequency and severity of the symptoms lessen until the condition seems to be gone. However, the skin often stays dry and is easily irritated. Environmental factors such as contact with harsh soaps or other chemicals can bring the symptoms back at any time, even as an adult. In normal skin, the outer layer of the epidermis, the stratum corneum, contains dry, dead, flattened skin cells that form a barrier protecting the other layers from irritants and keeping them moist. People with atopic dermatitis lose too much moisture from the outer layer causing the skin to dry and crack, thus decreasing the skin's protective ability, also known as the skin's barrier function. A person with atopic dermatitis is more susceptible to recurring infections like bacterial infections, warts, herpes simplex, and molluscum contagiousum. The type of rash and its location in atopic dermatitis is different for different age groups. 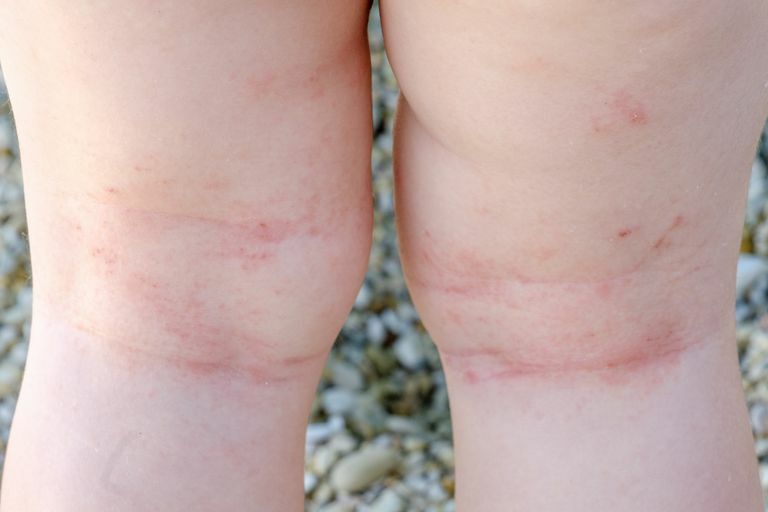 In infants, the rash is most often seen on the trunk, face, and extensor surfaces. The rash consists of papules and vesicles, or blisters, that ooze and then crust over. In children, the rash is seen on extensor surfaces, but also in the bend of the arm and behind the knees. The skin is dry and bumpy with scaly patches. In older children, adolescents, and adults the rash is seen on the face, neck, flexor surfaces, hands, and feet, but the skin is dry and thick. Bolognia, Jean, et al., eds. "Atopic Dermatitis." Dermatology. New York: Mosby, 2003: 200-12.